Fiction – hardcover; Knopf Canada; 336 pages; 2017. Don’t you love it when you pick up a book and it takes you completely by surprise? 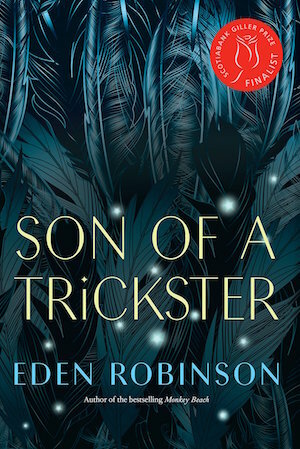 I was a little reluctant to read Eden Robinson’s Son of a Trickster — shortlisted for the 2017 Giller Prize — probably because the author’s bio on the inside flap of the dust jacket was cringe inducing (“Son of a Trickster was written under the influence of pan-friend tofu and nutritional yeast, which may explain things but probably doesn’t”) and expected the text inside to follow suit. But this coming-of-age tale about Jared, an indigenous boy growing up with a drug-addicted mother, utterly charmed me. The subject matter might be bleak, but there’s so much compassion — and heart — in this book that it’s hard not to fall a little bit in love with it. We learn very early on that Jared’s upbringing hasn’t been conventional. His father has run off to be with another woman, his maternal grandmother hates him because she thinks he’s a trickster (“he’s wearing a human face, but he’s not human”) and his mother is combative, potty-mouthed and messed up on drugs. By the time Jared is 16 he is living in the decrepit basement of his mother’s house, so that she can rent his room out to cover her bills. Sometimes she and her new boyfriend, Richie, disappear for days at a time “on business” (read: “acquiring drugs”), leaving him to his own devices. He has one constant companion — a beloved dog — but when she dies he finds it difficult to come to terms with the loss. It doesn’t help that his life is a constant battle to keep everyone happy: his fiercely outspoken mother; his father who lives a long bus ride away; his demanding step-sister and her new baby; his “friends” at school; the customers who buy his cannabis-infused cookies, which he bakes then sells to pay his dad’s rent; and his elderly neighbours, the Jaks, who pay him to do yard work. Yet Jared, who is caught between so many competing demands, is full of empathy for other people and cares deeply about them. When Mrs Jaks is diagnosed with cancer, he helps her out by looking after her husband, who has dementia, when she goes off for treatment. He befriends their troubled granddaughter, who self harms, and spends time with a young boy whose obsession with science fiction has turned him into an outcast. And he lets his peers crash in his room when they’re drunk or in need of a place to hide from their parents. Sometimes he’s taken advantage of — “He wished people could make undying declarations of love and loyalty to him when they weren’t half-cut or stoned out of their gourds” — but he knows how to stand his ground. When his step-sister Destiny tricks him into looking after her young baby without asking, he refuses to visit her again because he doesn’t “want to be played”; when his school friend Dylan vomits on his bedroom floor and goes home without cleaning it up, he never lets him stay over again. The one truly positive thing in his life is his paternal grandmother, Nana Sophia, whom he keeps in contact with via text message and Facebook. She offers him advice and support from afar, and issues an open invitation for him to come and live with her in Prince Rupert. But as the novel progresses towards its conclusion things don’t pan out the way Jared (or the reader) might expect. He begins hallucinating and the story takes a dramatic twist that shows the fragility of his young mind bent out of shape by too many drugs and too much booze and a lack of connection with his own indigenous culture. I really loved the whole feel and structure and mood of this book. The writing is sassy and sharp and infused with a whip-smart humour. The dialogue — and the often crude language — is spot on. But it’s the portrait of a teenage boy doing the best he can despite the circumstances which makes Son of a Trickster such a stunner of a read. My fellow Shadow Giller judge Naomi, who blogs at Consumed by Ink, loved this book too. You can see her review here. This is my 4th book for the 2017 Shadow Giller Prize. It sounds as if you might like this one to win? I would be happy for it to win, but it’s not my favourite. This sounds as though it might be a good book to read with late teenagers – a great deal of understanding but no ‘and they all lived happily ever after ending – would you say that was the case? Yes, actually, I would love for my 16-year-old daughter to read this! Yes; I’d agree. Jared’s quite a good role model for making the best of what you’ve got, but he does do morally dubious things like drink too much which would be good discussion points. Thanks, Naomi. This one did catch me by surprise and was all the better for it.